Last year, I celebrated my birthday on somewhere else in Indonesia. Greetings came from Facebook, and I didn't celebrate it. But this month. I am so glad that one of my unforgetable moment in my life is celebrating the birthday with your friends. So, I invite my class-mates and treat em (my father did) Banjarese food, its so fun and memorable. In other state, I got a girlfriend and asked her to walk arounf with my on birthday. But later, we broke up for some reasons. 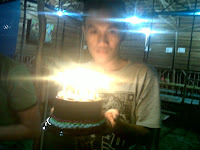 I hope in my 22th, I would develop and become more succesful. And I don't forget to thank to everyone.